10 ноября 2017 г. From November 1 to November 4, 2017 in Tsaghkadzor (Republic of Armenia) the III International Scientific Conference of Young Scientists "Modern Problems of Geophysics, Engineering Seismology and Earthquake Engineering" was held. The conference was organized by the A. Nazarov Institute of Geophysics and Engineering Seismology of the National Academy of Sciences of the Republic of Armenia (IGIS NAS RA). The conference was attended by the Director of GC RAS, Academician Aleksey Dzhermenovich Gvishiani and the Head of the Geophysical Data Laboratory of GC RAS Boris Arkadevich Dzeboev. 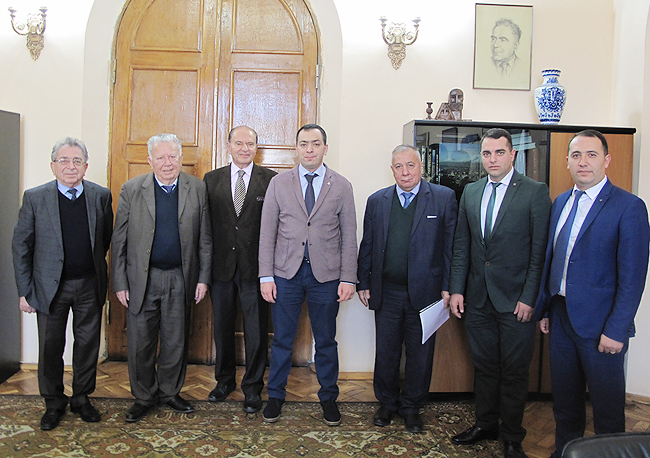 During his stay in Armenia, a number of working meetings of A. D. Gvishiani with the President of the National Academy of Sciences Radik Martirosovich Martirosyan, Vice-President of the National Academy of Sciences of Armenia Yuri Haykovich Shukuryan, Academician-Secretary of the Department of Chemistry and Earth Sciences of the National Academy of Sciences Levon Tavadyan, Director of the Russian Center for Science and Culture in Yerevan Sergey Rybinsky and other officials took place.